You’ve probably heard how, when Asian people come to the U.S., our “Asian” food is unrecognizable to them. I can attest that the two times I’ve eaten truly authentic Chinese food, it was NOT your run-of-the-mill sweet and sour pork. We’re talking beef tendon, tilapia peppercorn soup, and basically a real-life version of this scene from A Christmas Story. Truth be told, probably the only reason I finished was to not be rude to my gracious hosts. So, again, an Asian food expert I am not. What I do know, though, is that this recipe is a winner of a chicken dinner. With whole grains for fiber, chicken for protein, carrots and cabbage for veggies, and a sweet peanut sauce, it’s the whole package. It came to the rescue this past Monday night when our family was running around like crazy with various busy-busy December activities. A one-dish meal that gets on the table in 30 minutes? Exactly what I need this time of year–don’t you? So whether it’s truly Thai or just truly tasty (and easy and quick), I’m a fan. I think you will be, too. An Asian-inspired one-dish meal perfect for busy weeknights, this recipe boasts whole grains, veggies, and chicken in a tasty peanut sauce. 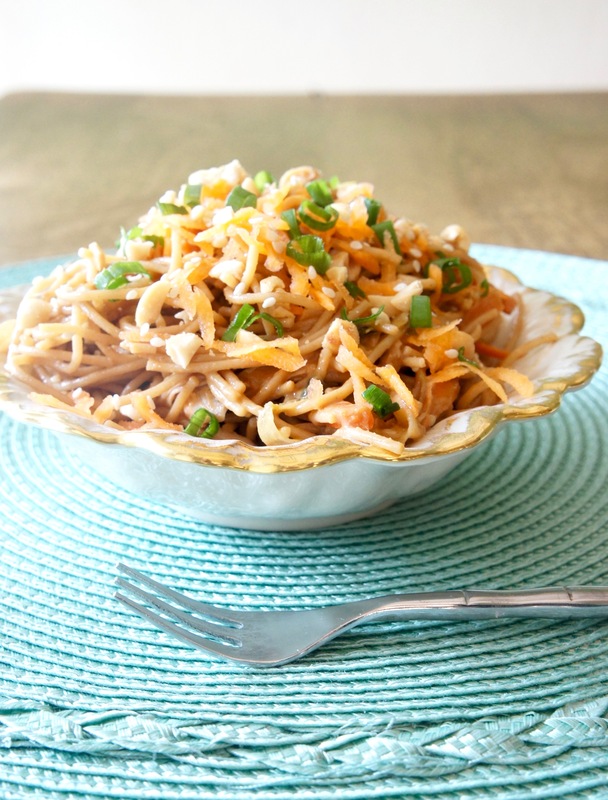 While pasta cooks, make the peanut sauce: In a small bowl, whisk together garlic, honey, peanut butter, soy sauce, rice vinegar, and ginger. Drain pasta and toss with 1 Tbsp. sesame oil to keep from sticking. Set aside. Wipe out pasta pan and heat the other 1 Tbsp. sesame oil on medium heat. Add carrots and saute until tender, about 5 minutes. Add cabbage and green onions and saute another minute or two until the cabbage begins to soften. Add the pasta back to the pan, along with the chicken and peanut sauce. Stir well to combine and continue cooking on low until heated through. 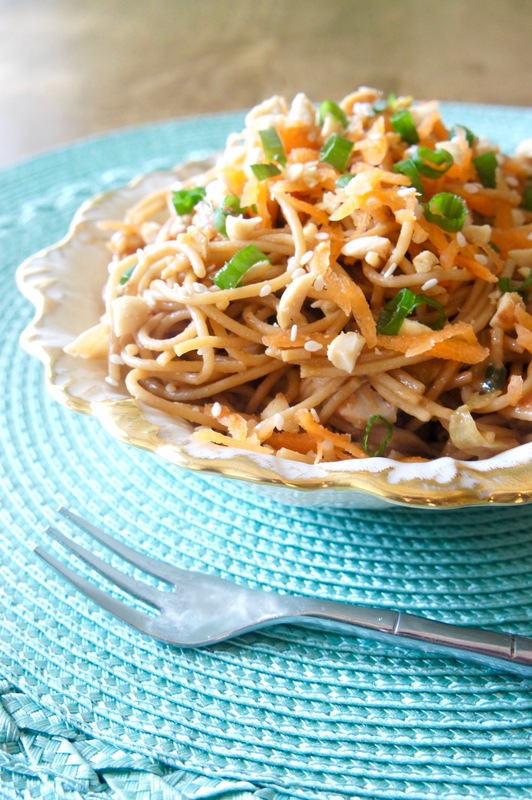 Garnish with additional green onion slices, peanut pieces, and/or sesame seeds. Serve immediately. Adapted from Dinner, Then Dessert. Remember those Arby’s commercials that ran awhile back promoting roast beef sandwiches on the premise that they were “Good Mood Food”? These ads always drove me nuts, because even before I was a nutritionist, I could tell you that eating processed red meat on a processed white bun slathered with overly sugary barbecue sauce was not going to be put me (or anyone else) in a good mood. In fact, the opposite is true. Thankfully, the American people apparently also saw right through this ad campaign, naming it one of the worst of 2011. (Luv’s diapers’ “Poop! There is is!” topped this list–though I find this one kind of disgustingly charming, don’t you?) We all know that, except under certain circumstances like after a REALLY rotten day at work or a beloved cat dying, junk food leaves us full of regret, not good vibes. So thanks but no thanks on the feeble attempt at deception, Arby’s. Healthy food, on the other hand, does actually have the power to lift our spirits. Research around the Mediterranean diet shows that this eating plan centered around fruits, vegetables, legumes, whole grains, olive oil, and seafood is linked with lower risk of depression. And I for one can say that I feel far better about myself when I’ve made healthy food choices. 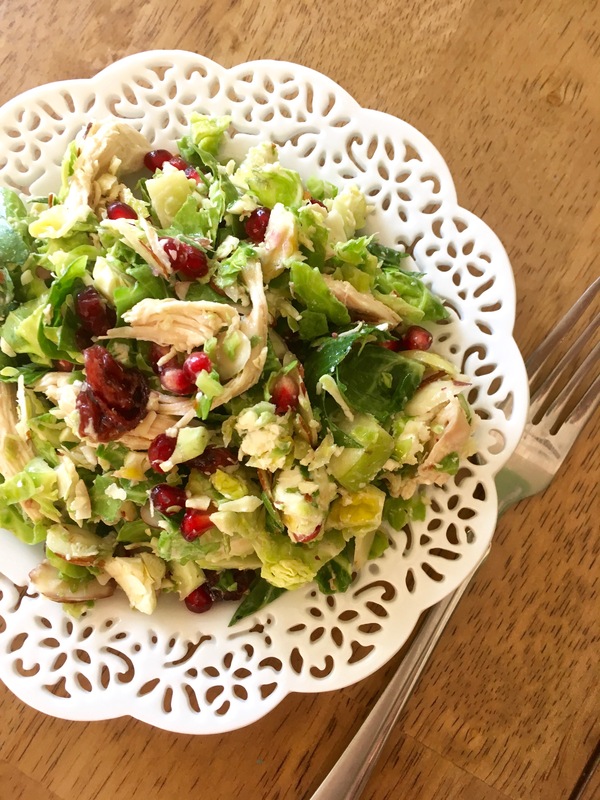 That’s where this Shaved Brussels Sprouts Salad with Pomegranate and Chicken comes in. 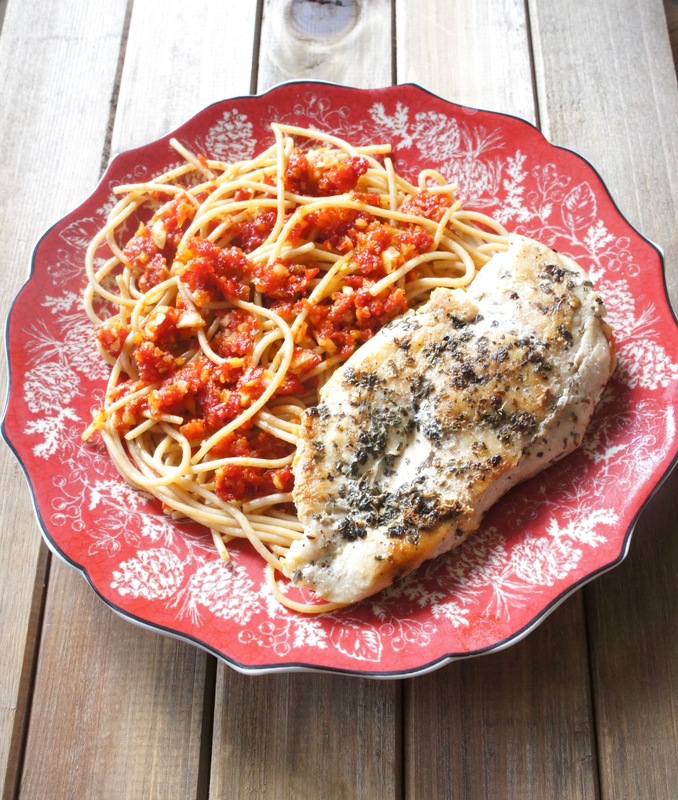 My kids and I had this for dinner the other night as an easy, light meal while my husband was out of town. Often, without my husband to feed, I go easy on myself by heating up something frozen or getting pizza. But once this salad was made, I realized it had hardly taken any time and, with its bed of greens, lean chicken, crunchy almonds, pops of juicy pomegranate, and olive oil-based dressing, I actually felt really good about eating it. Plus, I had some awesome healthy leftovers for lunch the next day. I’d say that’s the REAL Good Mood Food. With Thanksgiving right around the corner, this shaved Brussels sprout salad could also make a nice healthy side dish (without the chicken, perhaps) for the main event. I’d love to hear how eating it makes YOU feel! A delicious, colorful salad that serves as a light dinner or hearty side dish. In a food processor fitted with a shredding blade, shred Brussels sprouts. (I like to leave some larger bits for textural variety.) Pour into a large serving bowl. Add diced apple, pomegranate arils, cranberries, almonds, chicken, and goat cheese to Brussels sprouts and toss to combine. In a small measuring cup, whisk together all dressing ingredients. Pour over salad and toss to combine. Adapted from Spend With Pennies. Sometimes I think it’s a scandal that sun dried tomatoes don’t cost more. I’ve never made them myself (though, living in the Phoenix area, we’re certainly not short on sun…or dryness…or tomatoes), but I do have a dim sense of how much time and effort go into the end product of these shrivelly red strips. The process goes something like this: 1. Pick tomatoes 2. Wash tomatoes 3. Cut tomatoes 4. Season tomatoes 5. Dry tomatoes in the sun for days on end 6. Package tomatoes. Seems like an awful lot of work–and an awful lot of tomatoes, seeing as how they lose around 90% of their original weight and shrink down to less than half their original size upon drying. Yet there they are, a whole bag of them for only $3.00 at Trader Joe’s. Isn’t our food system strange? Despite the seemingly inverse relationship between cost and effort in sun dried tomatoes, I for one am quite thankful for their relative inexpensiveness, because I adoooooore them. Chewy, brightly colored, and tangy-sweet, I happen to think they bring their A-game to any dish they grace. And wouldn’t you know it, they make a pretty spectacular main ingredient in pesto. Health benefits aside, this chicken pasta boasts excellent taste and can be whipped up in about 30 minutes. Add it to your meal plan this week! A Mediterranean chicken dish packed with the healthy goodness of tomatoes, olive oil, and almonds. Add tomatoes, almonds, olive oil, lemon juice, and garlic to the bowl of a food processor. Process until nearly smooth, then taste and add salt and pepper to your liking. Set pesto aside. Make the spaghetti according to package directions. Meanwhile, season chicken on both sides with basil, oregano, salt, pepper, and garlic powder. In a large nonstick skillet, heat 1 Tbsp. olive oil over medium-high heat. 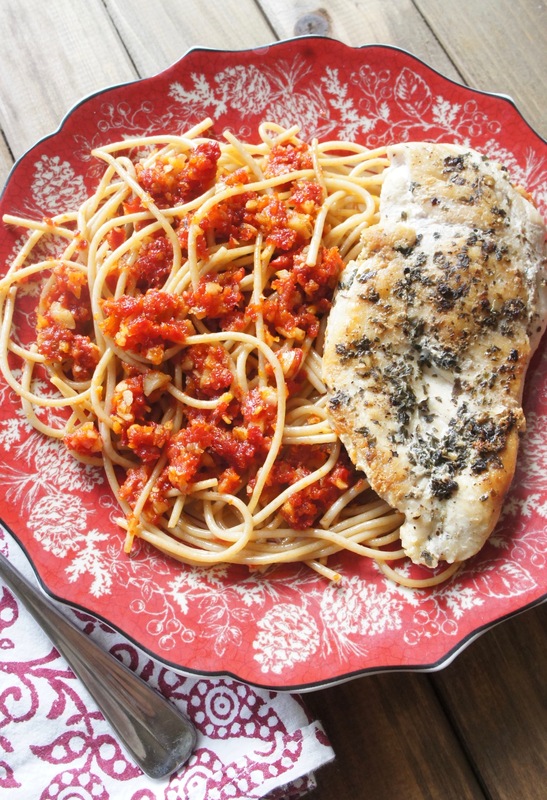 Add seasoned chicken and cook about 4 minutes per side or until internal temperature reaches 165 degrees F.
Serve immediately: assemble entree with any combination of spaghetti, pesto, and chicken you like! Apparently, what I think of as regular old sweet potatoes–the oblong, orange-fleshed vegetables in these photos and commonly found on your Thanksgiving table–are merely “soft” sweet potatoes, as opposed to “firm” sweet potatoes, which have a golden skin and white flesh. Yams, on the other hand, have a black, bark-like skin and purple or red flesh. And can we just take a moment to say that “flesh” is not the greatest word to describe anything edible. Regardless of terminology, however, these BBQ Chicken Stuffed Sweet Potatoes are one of my new favorite fall dinners. They’ve got a lot going on: potatoes baked to tender perfection meet sweet barbecue chicken and stretchy melted Monterey Jack (plus some spinach thrown in for extra nutrition). With veggies, starch, and protein all in one package, I’m content to call them a one-dish dinner–or round out the meal with a loaf of rustic bread. They’re also a clever way to use up leftover barbecue chicken, or to make a double-duty dinner out of a large batch of crock pot barbecue chicken earlier in the week. So whether you call them soft sweet potatoes, firm sweet potatoes, yams, or just “the orange ones,” I think you’ll be calling them a recipe to repeat once you give them a try. 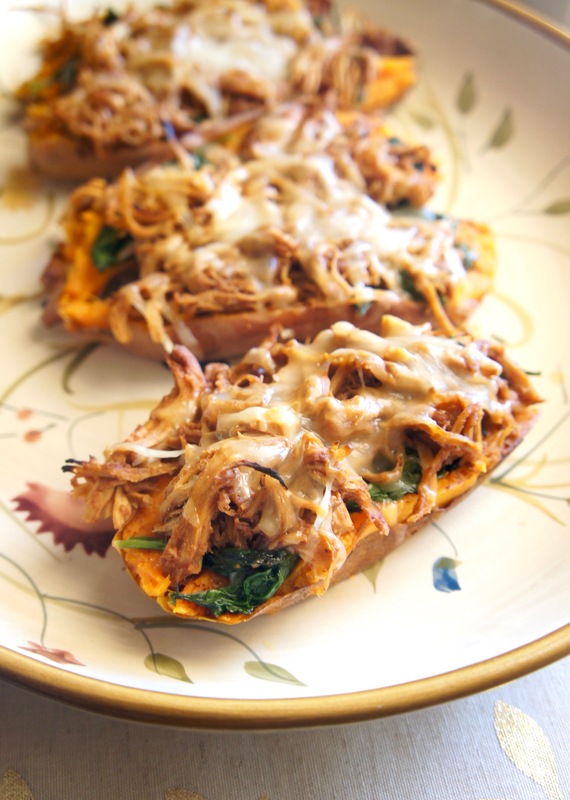 Sweet potatoes are baked to tender perfection and topped with BBQ chicken, spinach, and melty Monterey Jack in this fall favorite! Place chicken breasts in a slow cooker. Top with 1/4 c. barbecue sauce and cook on high for 4 hours. Remove chicken, drain of excess liquid, and shred. Return to slow cooker, stir in remaining 1/2 c. barbecue sauce, and cook an additional 15-30 minutes. Preheat oven to 400 degrees. Wash sweet potatoes and prick with a fork. Bake about 45 minutes or until potatoes are tender. While potatoes are cooking, heat olive oil in a large skillet over medium-low heat. Add spinach and saute until wilted, 2-3 minutes. Season with salt and pepper. Remove potatoes from oven and slice in half lengthwise. Line a baking sheet with foil and place potatoes on it. Mash potatoes lightly and sprinkle with salt, pepper, and chili powder. Top with wilted spinach and shredded chicken. Shred Monterey Jack directly onto potatoes. Return to oven and bake an additional 5 minutes, or until cheese has melted. Serve immediately. Inspired by Half Baked Harvest. This Thursday marked a super-serious-big-deal life event for me: after 467 hours of work over 9 months, I completed the nutrition internship leading up to my licensure as a dietetic technician! 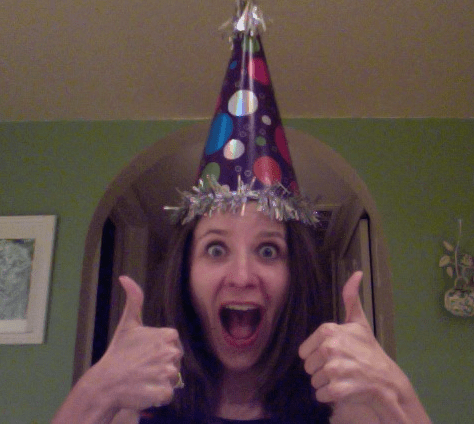 This is basically the face I have been making for the last 48 hours. I can’t tell you how good it feels to have to have this accomplishment under my belt–and to think that maybe in the near future I might actually get paid for the work I do! For this third and final portion of my internship, for the last two months I have been working in a hospital kitchen, learning about the business side of food service management, the day-to-day process of feeding 100+ patients, and how to create patient menus that are both healthy and appealing. One of my assignments was to create a new recipe the hospital might actually add to their patient menu. As I assessed the hospital’s menu for nutritional value, it didn’t take long to see that it was a very old school meat and potatoes-type meal cycle. In fact, if you were a patient at this particular hospital, in any given week you would receive 21 servings of meat–8 of them red meat, 7 of them pork, and 5 out of the 7 pork servings bacon or sausage. To me, this is frankly an ALARMING amount of red and processed meats to be serving to patients who actually want to get healthy, amirite? As I’ve written about before on this blog, reducing meat consumption–especially red meat–can have profound effects on both your health and the environment. I am all for it. 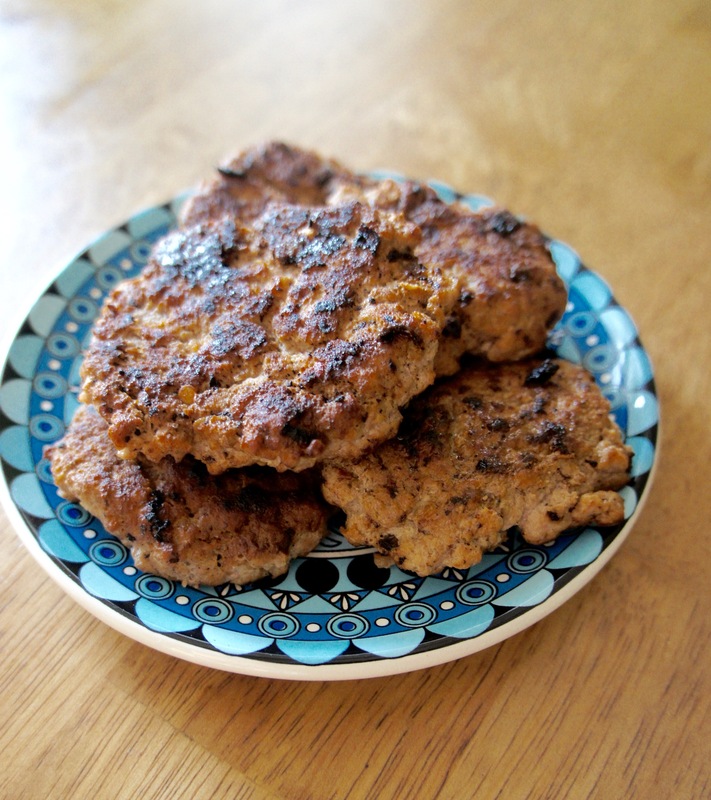 These tasty sausage patties I adapted from Monica over at The Yummy Life had plenty of flavor for almost 50% less fat and 75% less sodium than ground pork sausage. At a taste test for the hospital’s kitchen staff and dietitians, the finished product received very positive reviews. 80% of employees surveyed gave it the highest rating for taste and appearance and 100% gave it the highest rating for texture. For a breakfast food that comes in at about 100 calories and 5 grams of fat per serving, I consider that a success! 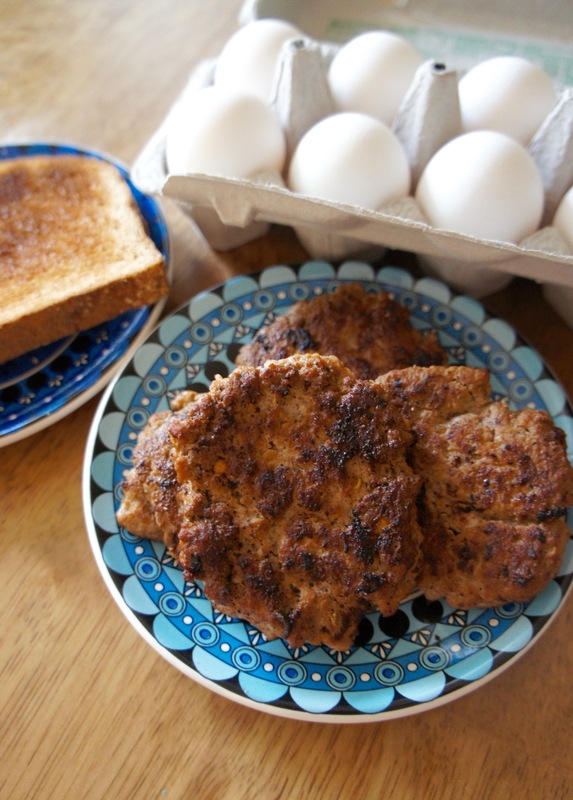 So if you’re looking for a better-for-you switch in the first meal of the day, or just a little something different for a weekend or special occasion breakfast, give this easy, low-calorie turkey sausage a whirl. If you want to make it a true stand-out meal, try a healthier spin on the egg McMuffin with an egg, cheese, and a handful of spinach on an English muffin. First step hospital menu, next step McDonald’s! In a large bowl, mix applesauce, salt, black pepper, red pepper flakes, dried sage, garlic powder, and onion powder. Add ground turkey and mix with applesauce-spice mixture until well combined. Form into 8-10 patties of about ¼ c. each. In a large skillet, heat olive oil over medium-high heat. Add the patties and cook until browned on one side, then flip and cook until browned on the other side. Remove cooked patties and drain on paper towels.